This May 10, 2010 segment from Australian TV show A Current Affair shows the impact—physical and emotional—of an out-of-control car smashing into unprotected pedestrians in front of a store at a suburban shopping strip center in Penrith NSW, Australia. 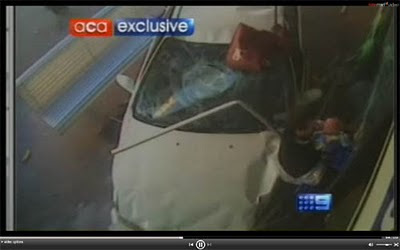 The father clings to his infant son despite being pinned against the storefront by the car. When you watch the video, you'll notice that only a shallow curb stands between pedestrians and nearby traffic.